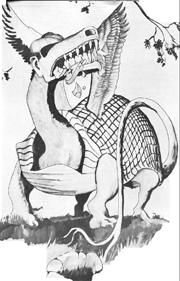 The Karkhagne is a mythical beast that was reported to roam the forests of Missouri in the past century. It is covered by fur, feathers, scales and armor plate, has a diet of limestone section corners, and can quickly escape humans or other carnivorous pursuers by completely engulfing itself within the recesses of its own hip pocket. It is the subject of considerable folklore and legends about forestry in Missouri in the early twentieth century. The Karkhagne not only symbolizes the importance of Missouri’s forests to all creatures, it also represents the unique and sometimes harsh nature of forestry at the turn of the last century. The Missouri Society of American Foresters has selected the name and image of the Karkhagne to represent its highest honor in recognizing a forester for his (her) contribution to forestry in Missouri. The Karkhagne Award is presented to a forester for outstanding achievement in forestry and service to the forestry profession. Read the following article from the University of Missouri Log in 1964 for more lore. Woods, Ed. 1964. The Karkhagne Missouri Log 17:34-36. Missouri Society of American Foresters members elected by the membership of the Society of American Foresters for outstanding service to the Society of American Foresters. 2013 - Michael R. Hoffman, CF, David R. Larsen, Ph.D. The MOSAF Forester of the Year Award is presented annually to recognize significant contributions to advance forestry or forest management in Missouri in a calendar year. Consideration is given to far-reaching impacts or contributions that go above and beyond day to day activities. This award recognizes exemplary on-the ground management efforts, original thinking, innovation, and creativity in solving a problem with forest management implications.